So you're looking to remove old skirtings. You might be removing new ones because you don't like the design. Either way, we've written this handy guide to help you remove them quickly and easily. We'll make this job easy for you by providing information on tools required and keeping your walls safe from harm. Now you know what you need you can get started so let's go ahead and jump straight in! Because you will be using sharp tools, we advise that you check around the skirtings before proceeding. In the UK, it's commonplace to have cables tacked to the top edge of the skirting. If this is the case with your room, you need to make sure this is removed before attempting to remove the skirting boards. This will ensure that you avoid damage to the cables and potential harm to yourself. Tip: you don't need to run cables along the top of skirtings anymore! Check out our rebate option for a cable management solution. Now you'll need to use the stanley blade. You'll need to take the sharp edge and run it along the top of the skirting where it meets the wall. Doing this first makes sure that the paint stays on the wall rather than coming away when you pull the skirting. Next, you'll need to use the hammer and the chisel. Using the hammer, gently knock the chisel in between the wall and the skirting. This helps to loosen it away from the wall. Simply work your way from one end all the way to the other using this technique. Now that the skirting board is nicely loosened, you can go ahead and start to remove it from the wall. You'll need to use your crowbar for this. 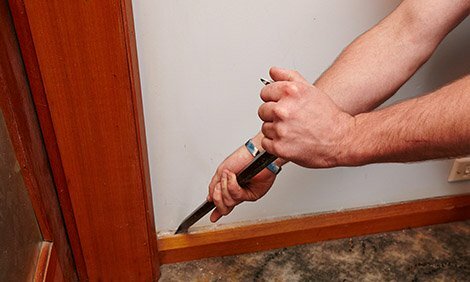 When you put the crowbar behind the skirting, use a block of wood between it and the wall to avoid damage to the wall. This helps to spread the pressure over a greater surface area to help prevent damage. It is also advised to only use the crowbar where the wall studs are situated so that the plaster has less chance of being damaged. When you've managed to get all the nails out of the wall, the board should be easily pulled away. Now rinse and repeat for the next piece! It's possible that once you've removed all the skirting, some of the nails may have been left in the walls. If this is the case, you will need your pliers ready to remove them. Take your pliers and firmly grip the nail you need to pull out. Apply a gentle pulling force. If the nail isn't removed easily, we would recommend hammering them flush into the wall. This will prevent damage to the plaster and also enable you to fit the new skirtings perfectly!